A decade after the Oscar-winning An Inconvenient Truth brought the climate crisis into the heart of popular culture, comes the riveting and rousing follow-up, Paramount Pictures’ An Inconvenient Sequel: Truth to Power. Watch the sequel’s trailer here. An Inconvenient Sequel will be shown exclusively at Ayala Malls Cinemas (Trinoma & Glorietta 4) starting August 30, 2017. Former US Vice President Al Gore continues his tireless fight, traveling around the world – including the Haiyan-devastated city of Tacloban, Leyte in the Philippines -- training an army of climate champions and influencing international climate policy. Cameras follow him behind the scenes – in moments both private and public, funny and poignant -- as he pursues the inspirational idea that while the stakes have never been higher, the perils of climate change can be overcome with human ingenuity and passion. 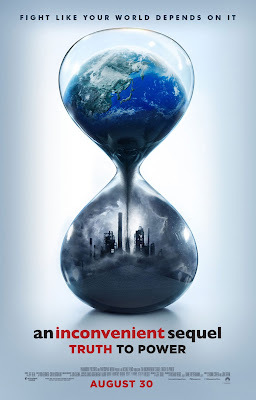 An Inconvenient Sequel: Truth to Power is distributed by United International Pictures through Columbia Pictures.